Before I start writing about the amazing trip I took to the Danakil depression, I ought to mention a few words about Debre Libanos and its monastery. In a few days, Ethiopian Orthodox will be celebrating Timkat, or the Epiphany which, like in other Christian calendars, falls twelve days after Christmas (Genna here). It is a time of great celebration in a country which remains deeply religious. After a long period of fasting during which orthodox followers did not eat any animal produce, people are ready to celebrate with the killing of a goat or sheep and the preparation of a feast. All over the city, streets are decorated with banners bearing the Ethiopian colours (red, yellow and green), and other signs of the impending celebration, while in most orthodox churches, priests start chanting as early as 4 am, using powerful speakers to reach as many followers as possible. At this time of year, one of the most sought-after trip is a pilgrimage to the holy site of Lalibela or to the monastery of Debre Libanos, one of the most important one in Ethiopia. Lalibela is out of reach for many people who do not have the means to travel far, however, for people living in Addis, Debre Libanos is only two hours away on the road northwards to Bahar Dar and lake Tana. 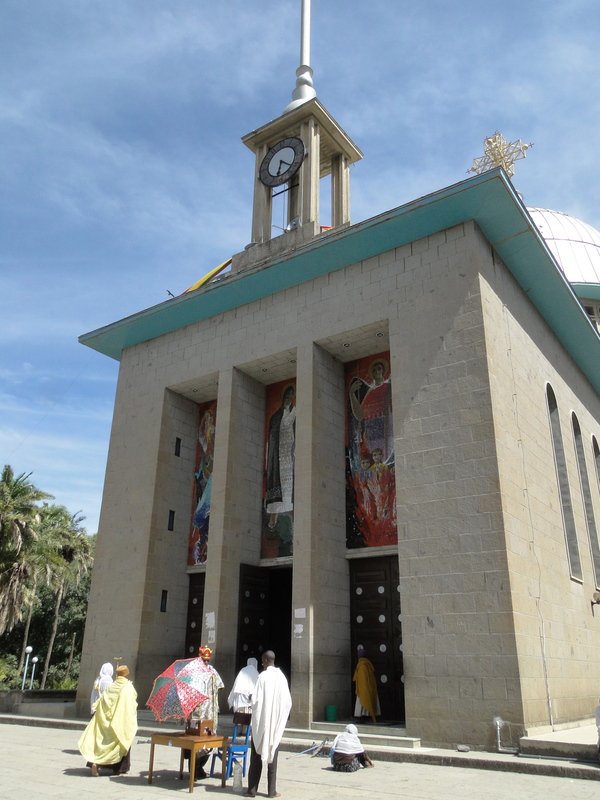 It is of great importance in the religious hierarchy of the Ethiopian Orthodox church, with the monastery’s chief Abbot being second in rank to the Patriarch, known as the Abuna here. The site is also known for its holy water which springs from a mountain source and is supposed to perform miracles. I took the opportunity of having two friends visiting to go on a day trip to Debre Libanos. Before going, I was asked by our staff to bring back bottles of holy water, particularly Alem and Alemnesh, who are very religious, on the verge of superstition. They really believe in it so they were very happy to get some water for the Christmas period. Overlooking the stunning gorge of one of the Blue Nile’s tributaries, the site has its charm even if it is nowhere as impressive as Lalibela or the remote monasteries on lake Tana. What is more poignant though is the troubled history of the place, particularly during the fascist occupation. Following an attempted assassination, the Italian governor Rodolfo Graziani, ordered the massacre of all the monks in Debre Libanos, killing more than 300 people in the process. Exactly four hundred years before, the monastery had suffered complete destruction during the invasion of Ahmed Gragn, the 16th century muslim conqueror who invaded Ethiopia. 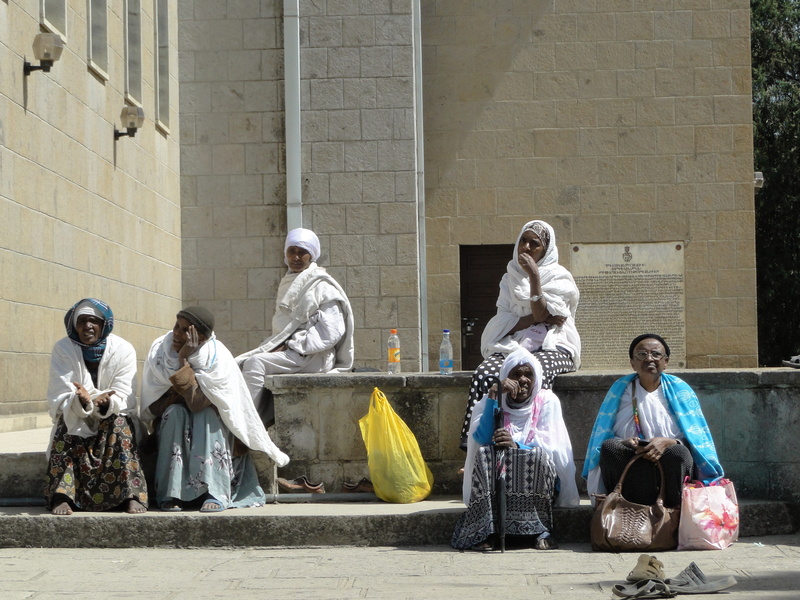 The first monastery of Debre Libanos was built in 1401 to commemorate the life of Saint Tekle Haimanot who had chosen this site to live as a hermit in the nearby cave where the holy water is supposedly found. According to the story we were told by our priest-guide, Tekle Haimanot spent 30 years of his life standing up and when he lost one of his legs, he continued standing on the remaining one. Today’s church is relatively new, having been rebuilt in 1961 by emperor Hailé Sélassié. It is decorated with beautiful stained glass windows created by the late artist Afewerk Tekle, one of the most prominent contemporary artist in Ethiopia who died in early 2012. The monastery has 800 members including 500 monks. 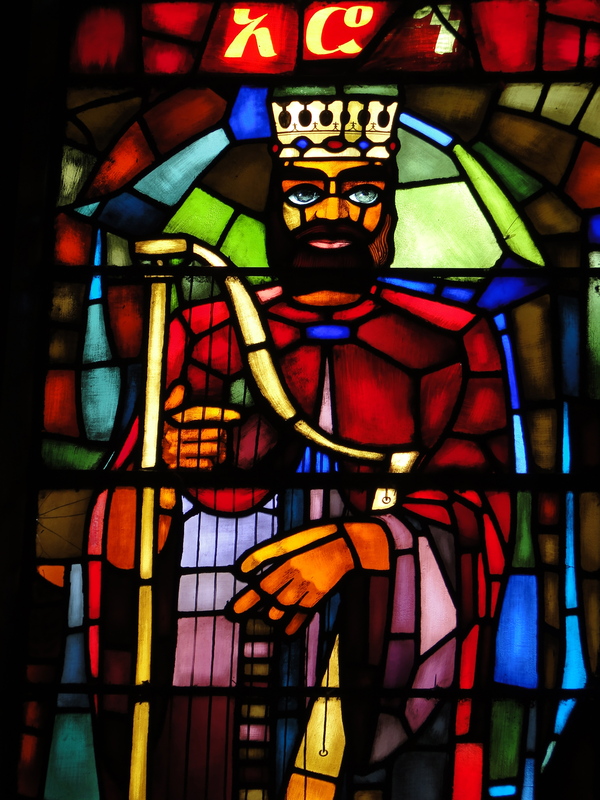 May I have permission to use the David stained glass image? I’d love to use it in a preaching series I’m doing on the life of David (print, website, etc.). Would you kindly advise? Thanks so much! Thank you for reading my blog, you can use the picture of course, if you don’t mind crediting the blog (even in small letters). I wish you a very good preaching series on the life of David. 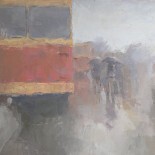 This entry was posted on January 16, 2013 by Salambo in Religious Ethiopia, Travelling outside Addis and tagged abuna, debre libanos, epiphany, Ethiopia, genna, holy water, monastery, orthodox christmas, orthodox church hierarchy, tekle haimanot, timkat.